These Ricotta Waffles are crispy on the outside, fluffy on the inside and have a flavour that can’t be beat! 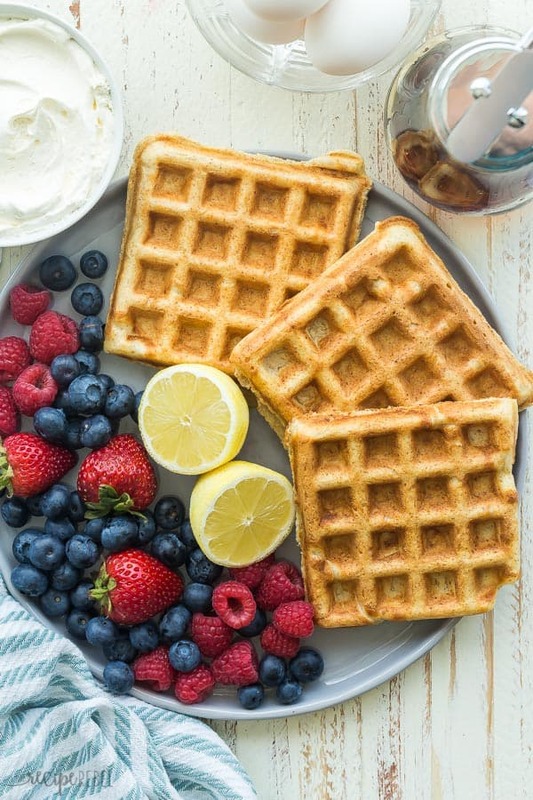 An easy waffle recipe that’s freezer friendly and perfect for busy mornings. Includes step by step recipe video. If you just knew how much we love our breakfast around here, friends. We will eat breakfast foods any way, at any time of day and there will be no complaints around the table! 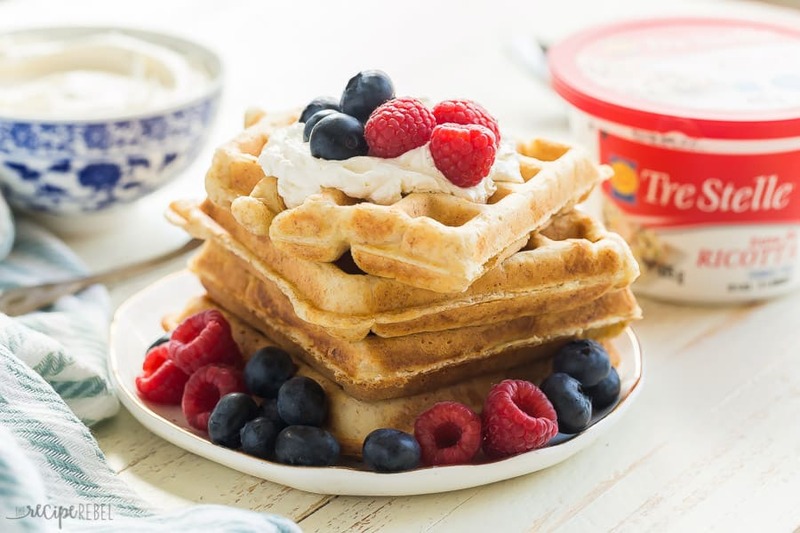 Lately, we’ve been loving on waffles. We used to be pancake people, but since discovering overnight yeast waffles we’ve never really gone back! They are so easy to prepare the night ahead, and in the morning they cook in just a few minutes. They develop the best flavour overnight and are the crispiest waffles I’ve ever had without separating the egg whites and beating them. 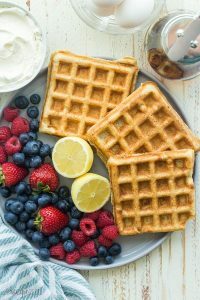 I know that there are those who insist that this is the only way to do waffles, but I say it’s because they’ve never made yeast waffles 😉 We are all about easy and delicious here, and extra bowls is never a part of my plan! If you’re not used to baking with yeast and find it intimidating, let me assure you that yeast waffles are incredibly easy to make! You just stir it into the batter and let that amazing, freshly-baked-bread flavour develop for a couple hours or in the fridge overnight. The Ricotta adds the best creamy flavor and makes these waffles so luscious inside that it’s almost a shame to cover them in syrup or strawberry sauce as we normally would. 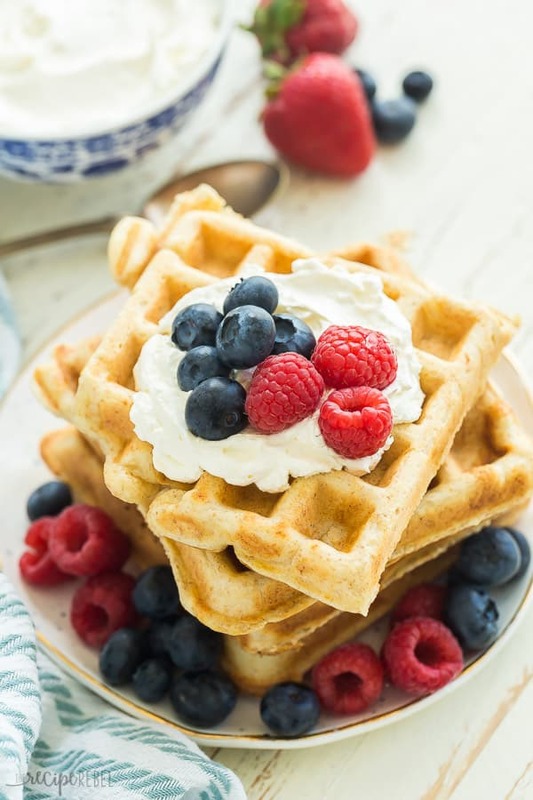 I think these waffles are best enjoyed with fresh fruit (they complement the Ricotta without overpowering it) and maybe a dollop of slightly sweetened whipped cream. If you want to get crazy and top these with some crispy fried chicken for dinner, I’m okay with that, too! 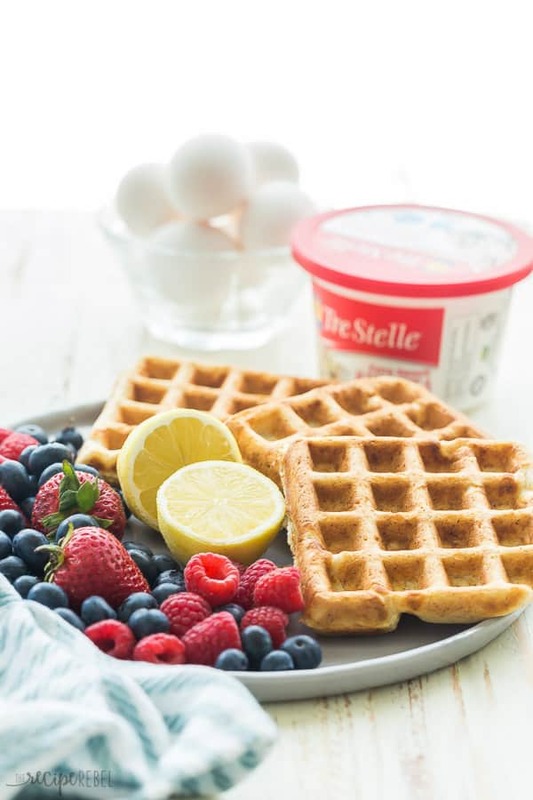 Great waffles start with a great batter — and the combination of Tre Stelle Ricotta, instant yeast, lemon zest and a little time hanging out on the counter (or the fridge!) make these some of the best. They are crispy on the outside, fluffy on the inside, and they come together in no time! Remember that all waffle irons are different. You know your waffle iron, and the best heat settings and the time it takes to cook. I personally like to crank mine up high and cook them quickly — they get a nice golden crust on the outside and stay moist on the inside. Don’t take them out too soon! We love making extra waffles to store in the freezer! They are the perfect quick, homemade breakfast for any busy morning. Simply let cool to room temperature and place in a large freezer bag or freezer-safe container. I don’t flash freeze or anything, and they still come apart easily when you just want a couple. Freeze up to 3 months. When it’s time to reheat, our favorite way is in the toaster. It’s quick, and they get crispy on the outside. I wouldn’t recommend warming in the microwave, but the oven on a lot temperature (225-250 degrees F) should also work. These Ricotta Yeast Waffles are crispy on the outside, fluffy on the inside and have a flavour that can't be beat! An easy waffle recipe that's freezer friendly and perfect for busy mornings. Includes step by step recipe video. Pour milk into a large bowl (you want to leave room for the batter to rise!) and microwave on high for 30-45 seconds, or just until warm but not hot. Add Ricotta, oil, eggs and vanilla and whisk until smooth. Add remaining ingredients and stir until combined. Cover with plastic wrap and let sit at room temperature for 1-2 hours, or refrigerate up to 24 hours. Turn waffle iron to high heat and spray lightly with non stick spray. Fill waffle iron according to manufacturer's directions, close, and cook until golden and crispy, about 5 minutes in our waffle iron. Serve with fresh fruit and whipped cream or as desired. I made these yesterday, only 1/2 the batch was good for two full sized Belgian Waffles. Used baking soda instead of yeast to save time, and made my own buttermilk with cashew milk and with teaspoon of vinegar. Added some cardamom and yuzu juice to the mix. Was great!! I’m glad you liked them! Thanks for sharing your swaps! I’ve never made yeast waffles and these sound amazing. Totally have to try it. Plus, the fact that you can make them overnight is a huge plus!